Hello! It’s Friday and it’s usually one of the happiest days because we have a whole weekend ahead. However, it is so dark outside this morning and rainy and just overall gloomy. It’s hard to get into my happy mood. Today was the second day that my morning drop-off for my oldest son was in the dark! Yup, the sun didn’t rise until another 15 minutes after I arrived home and to be honest, it’s barely lighter now. But do you know what makes my day light up? All things crafty. 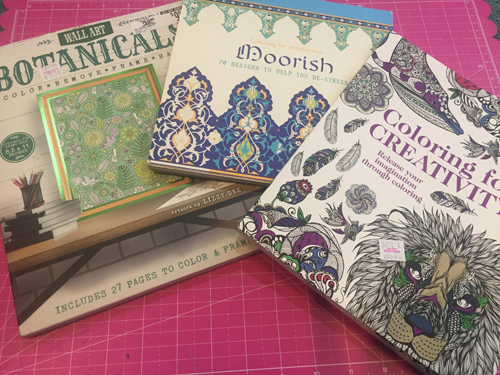 So today I’m sharing with you a picture of an accidental coloring book haul. You see, yesterday I went to pick up some clear bins for my snack station for my boys at Job Lot and I couldn’t leave without peeking in their discount book section and what did I find? Well, I found these three lovelies! They each only cost $1.99. Bargain!!! 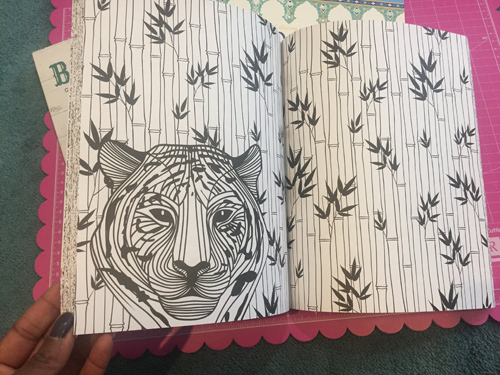 I love the tiger and bamboo in the Coloring for Creativity. I never colored bamboo before and look forward to the challenge of making them pop with dimension. The quality of this paper is medium weight and the pages are double-sided. So I will probably stick to using colored pencils in it. There is a mixture of fine items to color and wider images which are nice. There are so many pages in this one I can see me coloring. So it was a total bargain. I fell in love with the cover on the “Moorish Coloring for mindfulness: 70 designs to help you de-stress. I love to look at different types of architecture around the world on Pinterest and this cover design immediately peaked my interest. This one has a flip-top opening and each page is on a pad that can be detached. So it’s nice when you don’t want the cover to get in the way of your coloring process. I think this one will challenge me a bit because the images have so many tiny details but I think I am going to give it a try. The color combinations on the cover really make me happy so I am going to try to approach them with defined color schemes to keep the stress away. After all, it is supposed to be relaxing! The final one is “Botanicals Color, Remove, Frame, Hang with artwork by Lizzy Dee is really a cool concept. The paper quality in this one is fantastic. It’s really thick and has a bit toothy so it would work great for both my colored pencils and watercolor paints. So I am definitely going to try both out. The pages are sized for 8 1/2 x 11 frames. I look forward to coloring one for my craft room and maybe even for my laundry room. Ok, back to work for me. It is still rather dim outside but it’s Friday which means weekend, which means family time so I am happy. Have a blessed day and I will see you next week! Fun Photos Friday: Coloring Time!! Hello! It’s been so long since I have written a Fun Photos Friday post. But I would like to get back to them. Because they are so flexible, one week it might be a yummy recipe I’m inhaling, another a craft project another, or a photo from an outing. 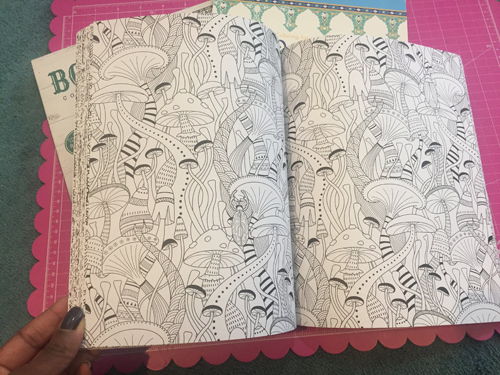 Today I thought I would share a photo of my first completed coloring page from a new coloring book I bought recently. It is called, “Autumn Scenes” by Creative Haven. I think it’s important to share completed pages to keep the motivation flowing. This past year, I started getting into coloring books and my Prismacolor collection bloomed. I started to watch videos and learn about products and good books. 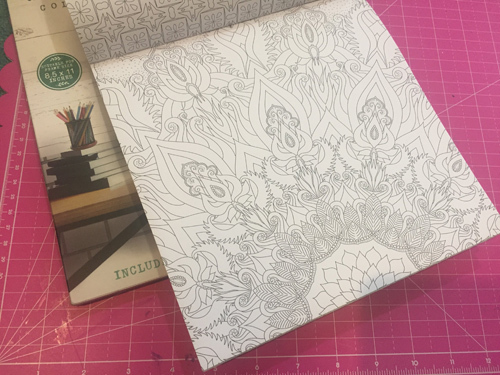 One of the ladies I like to watch on Youtube showed another coloring book from this company and showed how you can use Copics or colored pencils on the pages of these coloring books. They are thick and one-sided. Off to Amazon I went and was so happy to find them and they cost about $5.28 which is on the lower price point for quality coloring books. But after coloring this page I found the quality really fantastic. 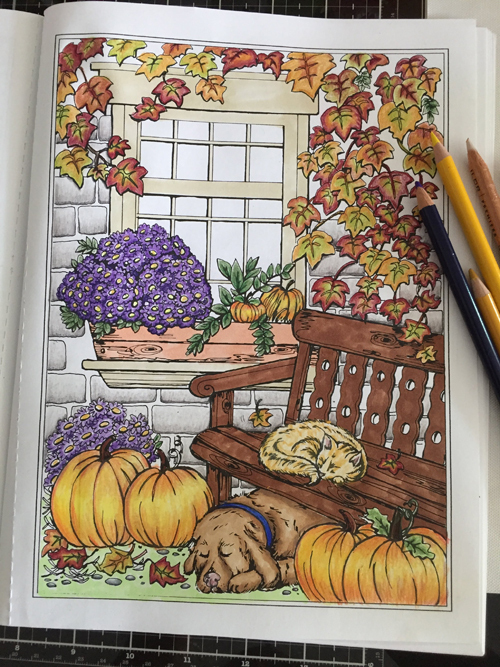 I used both Copics and colored pencils to complete this autumn scene. I love autumn and it’s so much fun coloring in the pages with all the pretty colors I associate with fall. 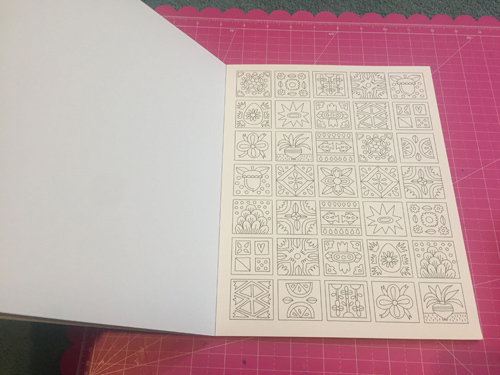 I will be sure to share more completed pages in the future. Have a fun weekend! Hello and happy Friday! It’s a cloudy morning with a light snow falling outside my window. I thought I would share a few things for my Fun Photos Friday post. 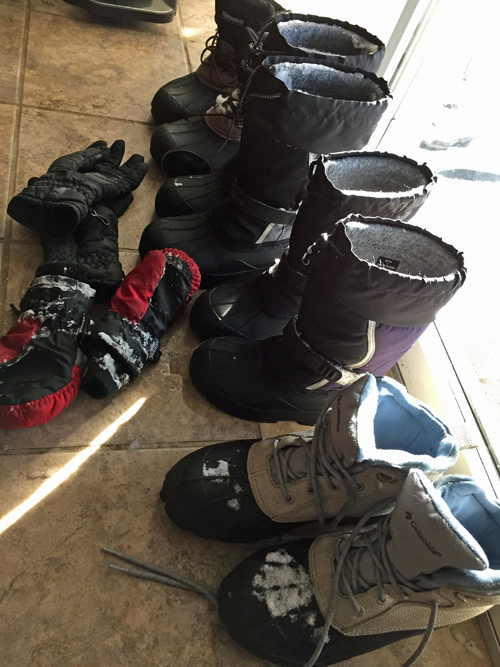 The first being our boots all lined up at the door after the snow adventures this week. It’s always a transition for the boys to start wearing their snow boots each year. They don’t want to wear them to school because then they have to change into shoes and back when they leave. But by the end of the season they still want to keep wearing them. Nicholas outgrew his snowsuit so I need to get him a new one but Apollo as you saw in previous posts, has stress tested his suit to the max. He loves laying in the snow and when I think way back (don’t say anything), I liked to lay down in snow too when I had my snow gear on. After this blizzard, I did stop and grab handfuls to marvel at the sparkling flakes. They were like beautiful crystals. I always liked when they talk about how no two flakes are alike and I love that idea. 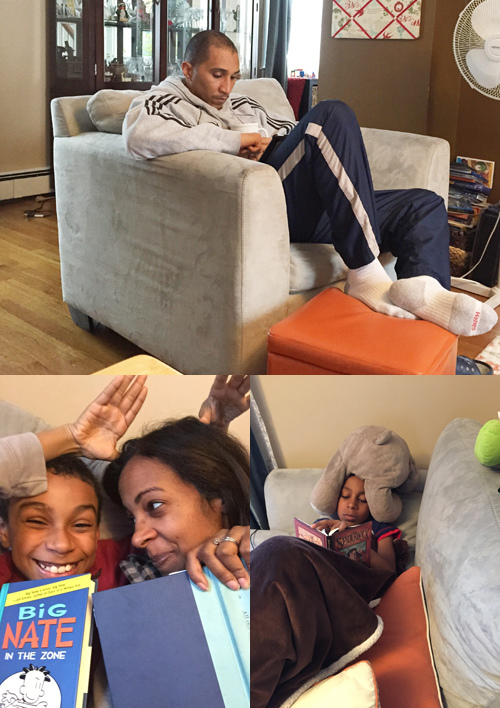 The Readathon on Saturday was a success in our home. 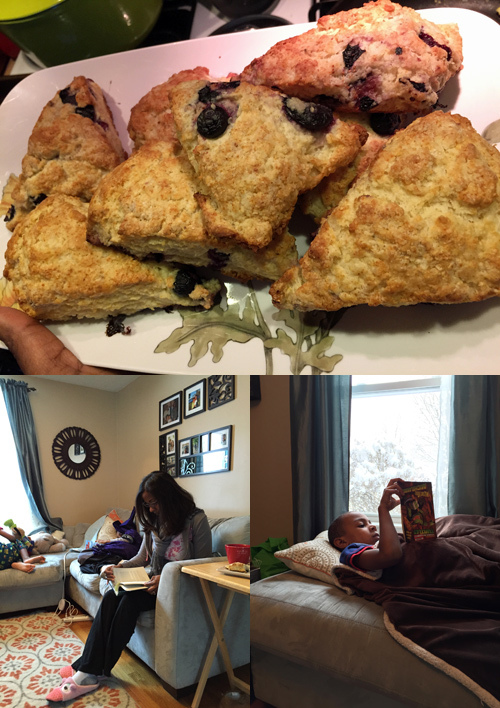 I made fresh scones for us to munch on while we dived into a 2 hour reading session. It was suppose to be three hours but I broke it up into two 1-hour sessions since they are a bit younger and didn’t want them to get fidgety. It was a total success. They brought their books and we had a great time. Leao joined us too so it was a family affair! Apollo of course brought his bear Bee and I’m not sure but I take it that having Bee sit on his head on while he read, relaxed him. It was so cute I had to take a picture. Of course Nicholas would not cooperate for a photo. He had to make ears behind my head. I’ll take it, since at least he was smiling! At our second session, we had popcorn for a snack while we read. 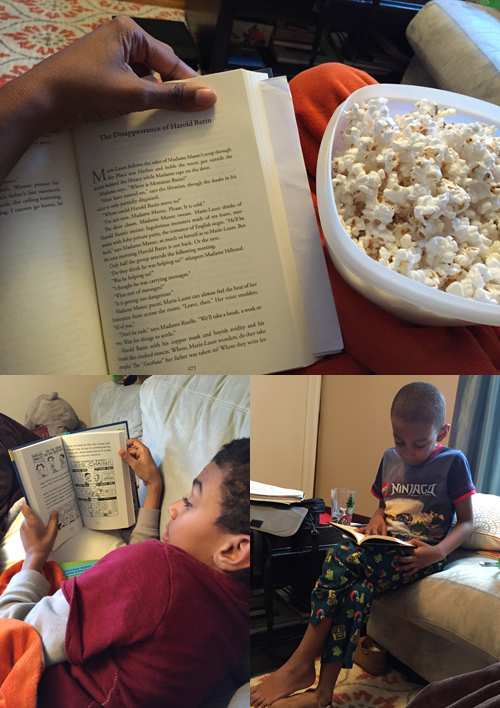 I got a good deal of reading during our readathon without guilt because we all were reading. It was really nice. I would love to have even a one hour session where we all read together more regularly. Something definitely to consider. Well I must go get some work done but I did want to let you know that I will be having my first Book Give Away on Tuesday so do be sure to check out the details. Have a blessed weekend my friends. 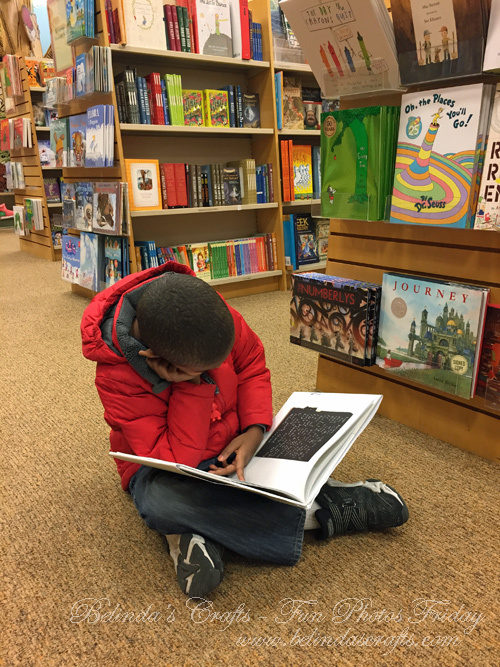 On Monday, I took the boys to Barnes and Noble for our usual book adventures. Nicholas immediately went to the book shelf to find a book he knew was being released to see if it had arrived. Apollo went to the opposite section of the children’s book area. I stopped to look around the vast selection of books that kids can access at this bookstore. I am always impressed by the amount of books available to children now and it makes me smile. When I looked up from the books, I peeked and immediately saw Nicholas then I started down the aisles to look for Apollo. Then I spotted him…sitting so peacefully on the floor reading a fun picture book about crayons. I didn’t say anything. I just watched him. He was so comfortable at this place filled with books and so engrossed in the story. I immediately put my phone on silent and took at picture. It’s the simple things like Apollo grabbing a book, plopping down and diving into the story that warmed my heart. Life is beautiful. Have a blessed Friday friends! Happy Monday: Happy Martin Luther King Jr. Day! Happy Mondayish and Happy New Year!!! !